These sweet potatoes were delicious! I loved them made this way because the roasting processes brings out the sweetness and gives the potatoes a nice caramelized stickiness. They are bursting with flavor and will be great made again in the fall. I think this would be a great addition to a Thanksgiving Day table. The only change I will make next time is to make them on parchment paper for easy removal. Foil was a fail! Preheat oven to 400 degrees and position oven rack to middle position. Line the bottom of a large baking sheet with parchment paper and spray well with cooking spray. 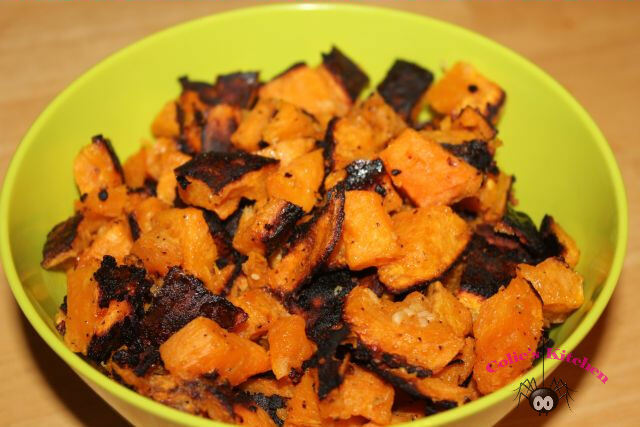 In a medium sized bowl, place the prepared, cubed sweet potatoes, garlic, olive oil, Parmesan cheese, dried thyme. Distribute the ingredients evenly to cover the sweet potatoes. Sprinkle with salt and pepper to taste. Transfer the sweet potato mixture to the prepared baking sheet and spread out the potatoes so that they are in a single layer. Roast in oven for about 40 minutes or until tender. 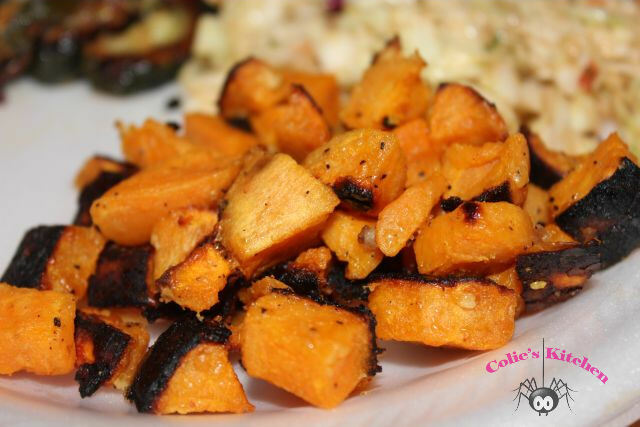 Set the oven to broil and broil until the tops of the sweet potatoes start to brown and get crispy about 5-10 minutes but be sure to watch them because they will burn. Why did My Simple Side Salad Go Missing? Old El Paso Recipes Ideas!